which hides my Valentine One radar detector. After following the Columbia north to Gifford, we took the free ferry across the river to the Colville Indian reservation at Inchelium. From there we took the fine high-speed road north along the west side of the river up to Hwy 20. I prefer this road to Hwy 21, as it has far less traffic and isn't patrolled nearly so heavily. We passed a large group of BMW riders stopped along side this road (there was a BMW rally in Republic, nearby, that day). Soon after turning west on Hwy 20, we saw a medium sized black bear cross the road right in front of us. We continued up to Sherman Pass, where we stopped to rehydrate and take some photos. 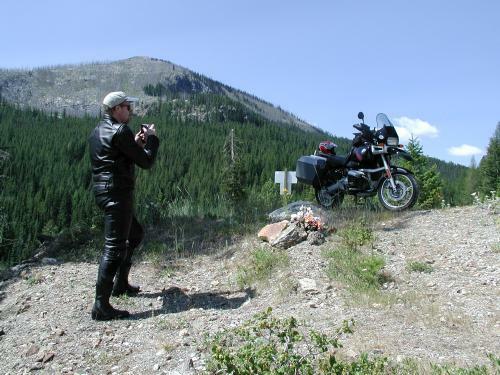 Here's a shot of Chuck taking a picture of his bike. At Republic, we tried to stop in at the BMW rally to look for some friends we thought were there, but they wanted $40 just to go in for an hour, so we passed. We then took Hwy 21 north, crossing at Danville into Canada. I had my passport, but Chuck didn't have his, and the Canadian Customs woman got a bit testy. I actually had to vouch for Chuck being a US citizen, as all he had was his WA drivers license and about a dozen other pieces of ID with his name and/or picture on them. At Grand Forks, B.C., we pulled into the parking lot of the Russian resturant I've enjoyed before, and just as we have parked and are taking off our gear, a guy walks over and says something like "Oh my God, I didn't think there was another one of these in B.C.". We turn and look, and there sits another FJR1300! 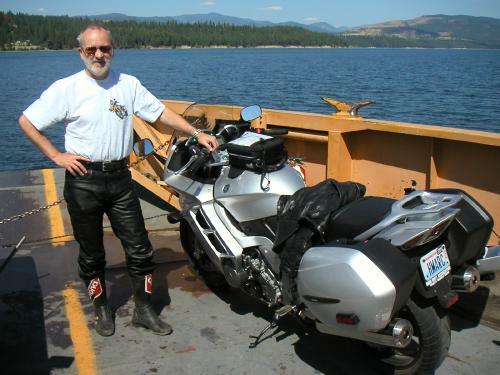 The guy, Paul Bouchard, was on his way back to Penticton after picking up his bike just the day before, and decided he wanted some Russian food. He'd just pulled into the parking lot seconds before we arrived. What are the chances of that? 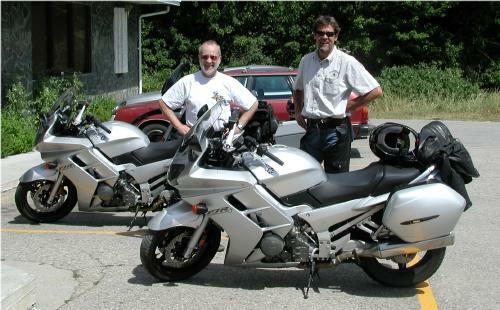 Note that Paul's Canadian-model FJR does not have the tacky reflectors on the saddlebags. I think it looks better without them. Scroll back up to the 1st photo to see my USA-model with the reflectors. So the three of us went in and had lunch together. Paul didn't know about our FJR site here, but had visited micapeak.com in the past and knew of it. Said he'd check out the FJR info we've got online. After a pleasant lunch, Paul headed toward Penticton, and Chuck and I headed home (no problems with the friendly US Customs agent at the border), this time turning south from Republic on Hwy 21 and taking the rough pavement reservation road back to Inchelium. 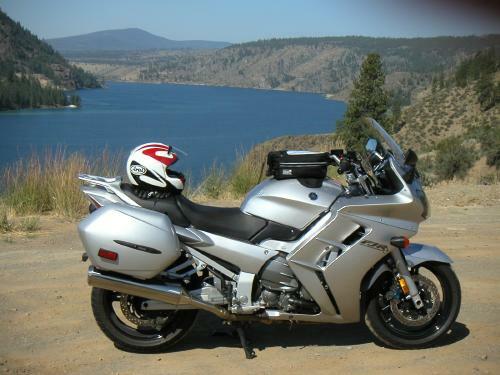 After re-crossing the Columbia, we rode north a few miles then took the excellent Addy-Gifford road over to Hwy 395, and from there, in heavy weekend traffic, back to Spokane.